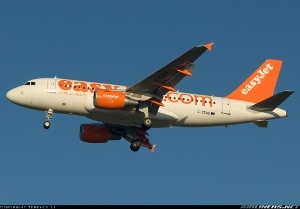 For my birthday in September, my wife bought me a ticket to Prague on Easyjet to see a friend, who was also my best man (and I was his) and also godfather to my boy (ditto to his daughter). I would depart on a Tuesday and return the Thursday, during some days when I would be off-shift, and my wife would be at work, with our son in nursery. Then, whilst on holiday in South Africa visiting my wife’s parents (http://www.airliners.net/aviation-forums/trip_reports/read.main/178930/), I received a Facebook notification from Air France instructing me to look at my email – I had won a competition, winning flights, hotel and entrance to the Formula One Grand Prix season finale in Abu Dhabi! First up was deciding who to take – my wife being first choice, but as our son was too young, she suggested I take my sister, another F1 fan, which I did. Then I needed to ask for some time off work for the weekend, which was granted by my manager. Then I needed to arrange transport back to the UK from Prague, as the first flight, LHR-CDG, was due to depart at 1010, when I was only due to arrive at STN that evening. 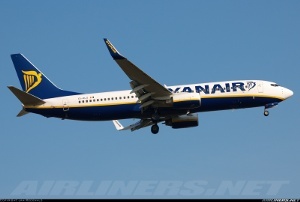 The cheapest option I found was a Ryanair flight from Berlin to Stansted the Wednesday evening for EUR12 (EUR17 including card fee), and a EUR29 train ticket from Prague to Berlin. Being that cheap, I decided to not spend stupid money on a hotel at short notice in London, opting to take a late bus from Stansted (£2.50 on Easybus), spend an hour or so in the 24 hour McDonalds before taking the night bus out to LHR. I left home early that morning, taking a train to Stansted. 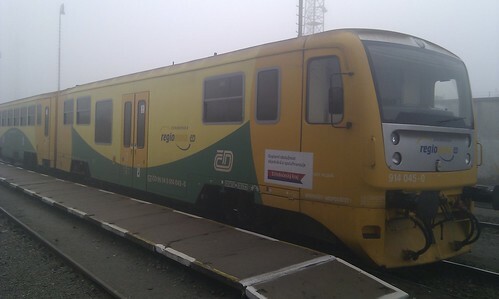 I needed to change at Ely, but the rail system was working that day and so I made it to STN without a problem. As I had checked in online, I had no need to queue at a desk so proceeded directly to security. I bought a sandwich meal from the branch of Boots airside, then had to wait until the gate was published. Once the number appeared, I took the little train to the correct satellite, to find a massive scrum at the gate. As it turned out, there was also a Pegasus flight to Istanbul at the next gate, which shares the same desk and stairway down. Once these passengers had boarded, I could sit down and wait. A queue for Prague was arranged beside the desks, which I joined. Once the SAW flight had finished boarding, ours was ready and the few priority boarders were followed by the rest of us. 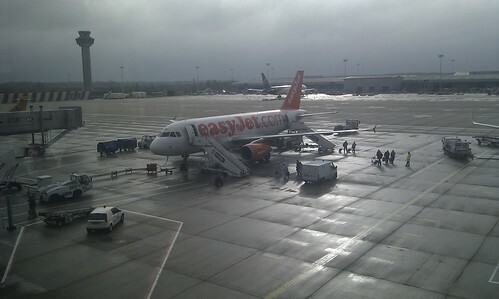 Our plane on the tarmac at STN. I headed for the rear stairs, with a small group of others, and boarded. There were plenty of empty seats at the back, so I took a window and settled in. Eventually the door was closed, there were hardly any empty seats, and we were off. I noticed a 747 cargo flight take off in front of us, then we were off. 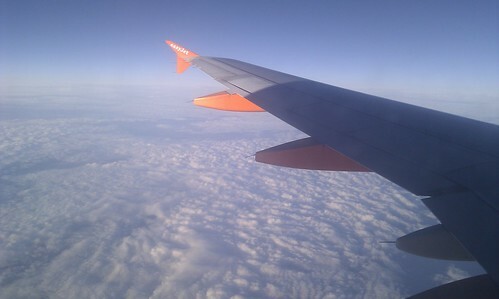 Unfortunately, low cloud for pretty much the entire flight hindered visibility. I let the BOB service pass by without buying anything, there was no need for me as I’d just had lunch. After a light doze, and listening to the guys behind me discuss how not to be ripped off by a taxi driver, we commenced our descent and landed. 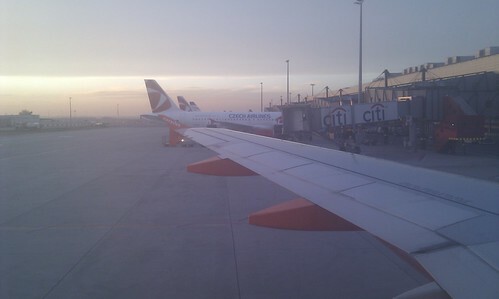 We taxied for some distance, pulling up to a jetbridge gate in the Schengen area – I wondered how this would be resolved. The door was opened, and everyone disembarked. Up the bridge, then down stairs, out of a door and into a waiting bus. Which then took us along the building to the non-schengen area, and we went up into the building, and followed the regular route out. I bought a 24hour ticket for the city transport system, and waited outside for a bus. I arranged to meet my friend near his office, and we had a few rather tasty Czech beers before dinner, then headed back to his flat. During the course of conversation, it first transpired that he was driving to Dresden the next day, and that I could have a lift for the journey, halfway to Berlin. Later on, it turned out that another of his friends was booked on the same FR flight that I was on! She needed to leave Czech overland, as her visa had expired, being a US citizen, and was told that German border control would be less likely to notice! I was unsure, but she had an appointment at the Czech embassy in London to resolve the problem. Anyway, the following morning, my friend, his 2 year old daughter and I went for a walk, took the little suburban train to the Andel area, had Paul bakery items for breakfast and visited the model railway (his daughter loves trains, trams, busses, all transport really). After her curiosity had been satisfied, we took the bus back to the flat, had a quick lunch before we left in the car to pick up the American (I‘ll call her Mary, not her real name) and head for Germany. The motorway to the German border has still not yet been completed, but we made it to Dresden in plenty of time. After saying good bye to my friend, we found a café by the station to sample the German speciality, Currywurst, before the train to Berlin. Mary had to buy a ticket, and I had an e-ticket issued by CD.cz, the Czech railways. These were both ok, and the train journey was uneventful, especially as it was dark by now. 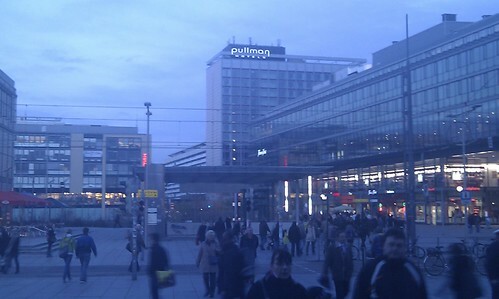 We arrived at the new Berlin Hauptbahnhof, and transferred to the Airport Express to Schoenefeld. First thing I noticed was the huge, open air departure board outside the airport, when walking from the station. 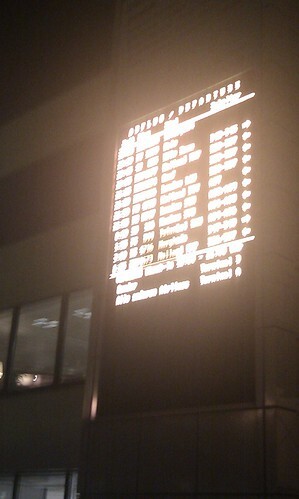 The open air departure board. Then we entered the terminal. As a US citizen, Mary had to have her document checked at the checkin desk. This was fine, and the guy even said that here, at SXF, this could be done at the gate, despite what Ryanair claim on their website. Then we went through security. There was an attendant on station, instructing everyone flying FR to test their carryon baggage in the metal frame size tester. My rucksack was fine, but Mary’s case was too big – not by much, so the attendant advised moving some items from her bag to mine. This done, and both re-tested, we were cleared to proceed. Security passed, she wanted to buy some water, but the cheapest option was for EUR3 for a 500ml bottle! As she was thirsty, this was the only option. I’m sure though that a beer would have been cheaper! Anyway, at SXF non-Schengen flights, the passport control booths are at each gate, and are only manned when there is a flight needing them. We joined the queue, and I made it through with barely a glance. Mary, however, had some issues, due to the fact that she had outstayed her Schengen visa issued in Czech by some days. She was trying to explain without letting slip that she was accidently an illegal immigrant, on her way to a different embassy to resolve her situation, with difficulty. I was waiting around the corner, and heard at one point “Show me the documents! Show me the documents!” coming from the Grenzpolizei somewhat harshly. Eventually she was allowed to pass, and our boarding passes were checked again, along with our hand luggage size (again). I had been chatting to the guy before my companion joined me, and after looking at our two bags, he explained that we should move some stuff across, again. With a smile… “Of course” we replied. We were in a holding room, with a small cordoned off area for priority boarding passengers. The flight arrived, disengorged its passengers, and we were ready. This really was a rugby scrum, or race, as the priority passengers were let out the door onto the tarmac, immediately followed by everyone else. I mentioned that I would aim for the back door, which I did, and we got seats near the back, me with the window, not that there was much to see at night. Doors closed and we were off. Load was around 80%, but then I had bought a ticket for EUR12 just 2 weeks before, and my companion had paid EUR30 just 3 days before, so that flight can’t have made FR much money. On takeoff, I pointed out the lights of the construction site of the new Berlin airport, on the SXF site. Compared to the previous day’s legroom, FR really seem to squeeze you in, and the hard plastic chairs are unforgiving of your knees, especially if you’re 6’2 (1.88m) like me. This flight, like the previous, was uneventful. I dozed for the most part, Mary reading her book. On landing, we exited the aircraft, and I spotted a 737 with winglets, in the livery of Ethiopian – not a usual visitor to Stansted. I assume it was a new machine, on delivery flight from Seattle? I made my way to the electronic passport gates, as the queue was significantly lower than the regular, EU passport desks. After getting through, I waited for Mary, and we exited. We bought some water and biscuits from the Spar mini market in the terminal, and Mary bought a ticket for the Easybus that I was allowed to take – I’d booked the 2.30am bus (we arrived just after 11pm), but was allowed to move it forward by 1 hour, depending on space. As it turned out, there were just us two, plus 3 Japanese guys on the bus. Waiting for it, we sat in the Krispy Kreme seating area, as it was closed. The bus departed ontime, and took less than an hour from the terminal to central London – a record in a road vehicle, but the driver was certainly going a bit too fast on the local roads towards the centre. On descending, it was freezing, but we still decided to walk down to the Strand, to the McDonalds there. This took half an hour or so, past some of the famous London landmarks, and we warmed up with a Big Mac meal, with tea. At that time of night, the place was filled with drunk students, and police officers getting their night shift snacks. After eating, I left Mary to head off to the bus stop outside.